In Figure 3, “a” and “c” show strands as normally laid into the rope to the right in a fashion similar to the threading in a right-hand bolt. Conversely, the “left lay” rope strands (illustrations “b” and “d”) are laid in the opposite direction. Again in Figure 3, the first two (“a” and “b”) show regular lay ropes. Following these are the types known as lang lay ropes (“c” and “d”). Note that the wires in regular lay ropes appear to line up with the axis of the rope; in lang lay rope the wires form an angle with the axis of the rope. This difference in appearance is a result of variations in manufacturing techniques: regular lay ropes are made so that the direction of the wire lay in the strand is opposite to the direction of the strand lay in the rope; lang lay ropes are made with both strand lay and rope lay in the same direction. Finally, “e” called alternate lay consists of alternating regular and lang lay strands. Figure 3. 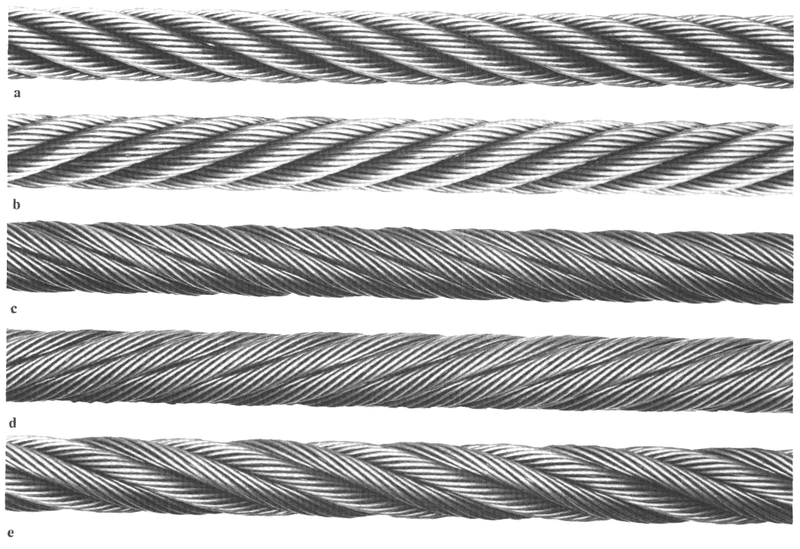 A comparison of typical wire rope lays: a) right regular lay, b) left regular lay, c) right lang lay, d) left lang lay, e) right alternate lay. Of all the types of wire rope in current use, right regular lay (RRL) is found tin the widest range of applications. Nonetheless, in many equipment applications right lang lay (RLL) or left lang lay (LLL) ropes are required. At present, left lay rope is infrequently used. As for alternate lay (R-ALT or L-ALT) ropes, these are only used for special applications.